Hari Raya Nyepi is the New Year for Balinese Hindus celebrating the Caka Year of 1939. On this very auspicious occasion, many ceremonies and rituals are held throughout the Island of Bali, & we have detailed below the events taking place during this period and would ask you to respect the Balinese culture during your stay in Bali. One of the most important preparations for the coming New Year is the Purification Ceremony, known locally as “Melasti”, held along Kuta Beach. The local Balinese will take offerings and holy objects such as statues and “keris” to the beach for ritual cleansing. They will also conduct prayers & cleanse themselves in the sea. Local authorities invite you to witness this ceremony with decorum & from a distance. Tourist are requested to walk around Kuta’s public areas &/or the beach in proper clothing & NOT bikini. 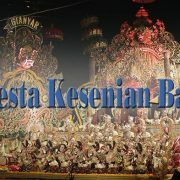 A ceremony will be held at Bale Agung Desa Adat Kuta temple commencing approximately 3pm. Please expect there to be some traffic delays during this time. 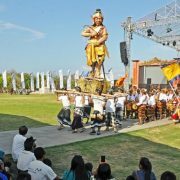 The climax of ritual activity is on the eve of Nyepi. During these solemn, powerful hours, priests throughout Bali will perform a Tawur agung, praying and ritually sacrificing a variety of animals to appease the demons and honor the gods in an attempt to harmonize the conflicting universal powers of good and evil. Ceremonies (Tawur Kesanga) will be held at Desa Adat Kuta Square & in front of Bale Agung Adat Kuta temple, commencing 4pm onwards. During this time Jalan Legian will be CLOSED by local authorities therefore please expect there to be traffic in the Kuta area. Please ask our staff at Reception should you require any assistance in communicating with your contact for transportation. 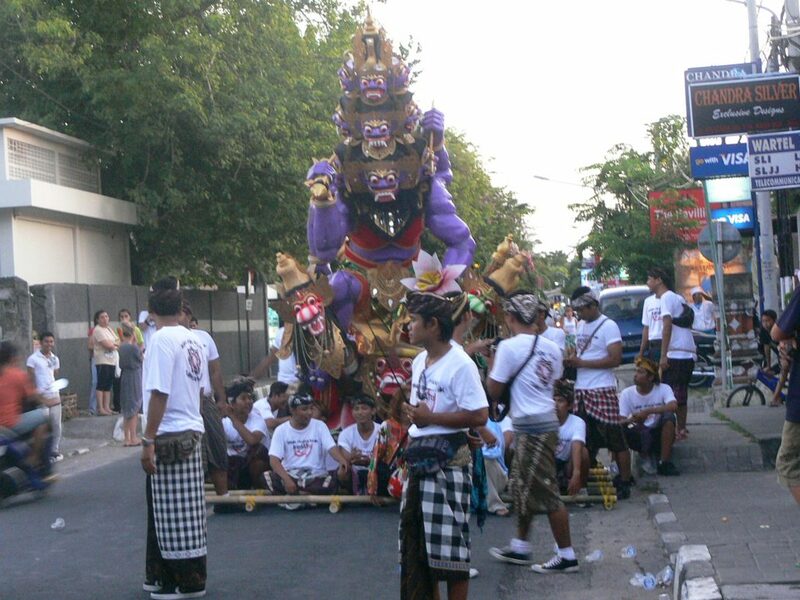 Join in the fun of watching this special Balinese event, for a good vantage point walk down to Bemo Corner (temple in the middle of Jl Legian & JL Raya Pantai) to enjoy the evenings festivities . The first day of the Caka New Year, also known as Hari Raya Nyepi, is a Day of Complete Silence in Bali. The whole island will be void of people on the streets (since it is mandatory for everyone to stay indoors) or on the hotel premises and there shall be NO noise, NO lights and NO activities in whatsoever form. The whole island of Bali shall appear deserted and therefore it is believed that the evil spirits will pass over the island. We seek your cooperation in observing the following mandatory rules issued by the Religious Department of Bali during the celebration of Hari Raya Nyepi. Guests are not permitted to leave the premises of the Hotel commencing 6am Tuesday 28th March until 6am Wednesday 29th March 2017. To do so is considered a criminal act. All guestroom night curtains are required to be fully drawn from 6pm Tuesday 28th March until 6am Wednesday 29th March 2017. You are requested to keep lighting to a minimum as no lights are to be seen from outside. The entire hotel’s outdoor lighting will be completely switched off following sunset on Tuesday 28th March 2017 until sunrise on Wednesday 29th March 2017. This means that the Hotel’s swimming pool & Jacuzzi will be closed from 6 pm Tuesday 28th March 2017 till the following morning. A Buffet Dinner will be served in Nangka Restaurant by candle light until 7pm. Room service will cease operating at 6pm. In addition, as per a new regulation of the Government of Bali, all television providers including cable channels, will not broadcast during Nyepi Day. To compensate this decision we will set up an In-House Movie program from 6am Tuesday 28th March 2017. Should you have your own DVD’s we have limited DVD players available for rent @ Rp50,000/day, but this will be on a ‘first come first serve basis’. The second day of the Caka New Year, also known as “Ngembak Geni”, is a Day for Hindu people to do ”Sima Krama/Dharma Santi”, visiting and apologizing to one another. On this occasion, you may visit a market called “PASAR MAJELANGU”, which will be held along the Kuta Beach area. Please also be aware that on this day, shops and restaurants will start to open after 12.00 noon but most of them might remain closed.